Have you ever felt like people around you are getting better at English but you are not? Then you keep looking for good books to help you out, VOCABULARY AT HAND IS THE ONE! Starting to learn English from its roots sounds hard work and ‘yes, it is’ but the first section of VOCABULARY AT HAND will help you with its various word examples and easy ways to remember. Plus, you can check your understanding with the checklists on your left hand on each page. Confused words are also the problem for learners too; therefore, VOCABULARY AT HAND will comfort you with all explanations for each one of them and you will fully understand both meanings and uses. Think about the time when you need to write term papers, it has never been easy, right? Please remember RIGHT WORDS IN THE RIGHT PLACES MAY GIVE YOU THE GREAT OPPORTUNITY. Besides, collocations are considered as the hardest part for English learners and if you go with the wrong collocations, your pieces of writing may not be as smooth as it should be. Then starting talking and writing with the right ones. 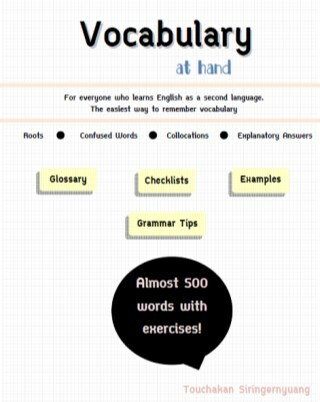 In addition to English roots, confused words and collocations, synonyms, checklists and easy example sentences are also provided in VOCABULARY AT HAND as well. It's like a complete guide for the learners.